I'm going to apologize in advance for the picture overload. This might be the cutest thing I've ever made. Except, of course, for the cute thing I made that's wearing it! 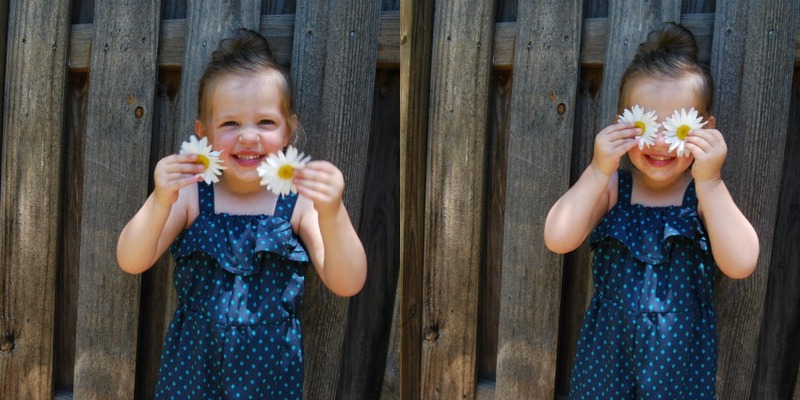 There was a little bit of bribery involved in taking these photos, but for the most part she cooperated. She's got personality, this girl, that's for sure. Pattern Description: McCalls 7376. 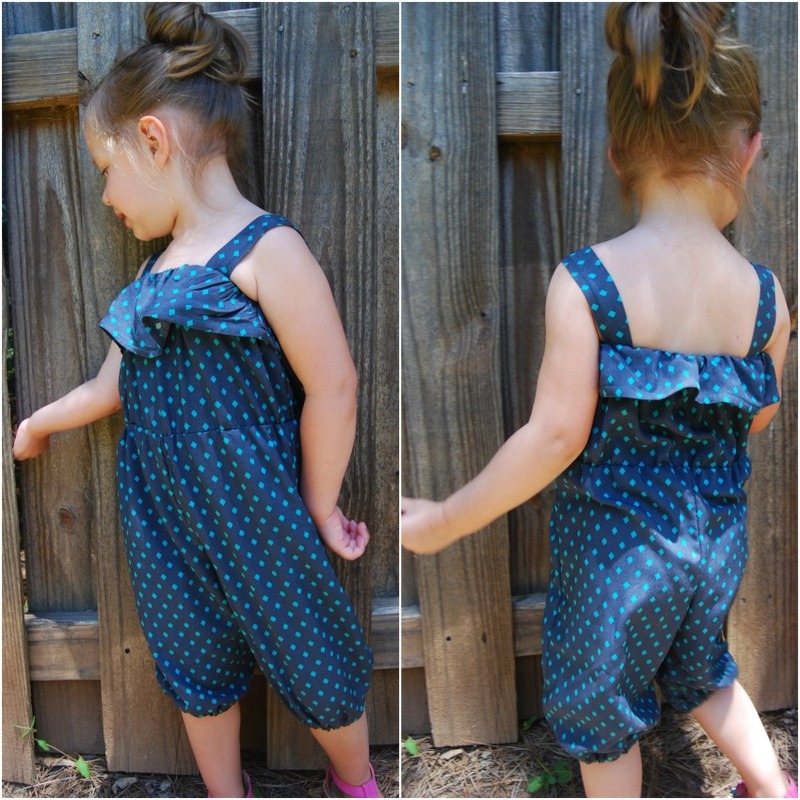 Girls' blouson romper and jumpsuit pattern. There are strap and length variations and some cutesy little trim details. I made view C with the single ruffle and elasticized, below-the-knee legs. Is this not the sweetest little pattern? I was buying other McCalls patterns at the latest pattern sale and saw this one from their early summer release. It moved to the top of the queue and I made it right away. It's just so adorable. Pattern Sizing: Children's sizes 2-8. I made a size 4. 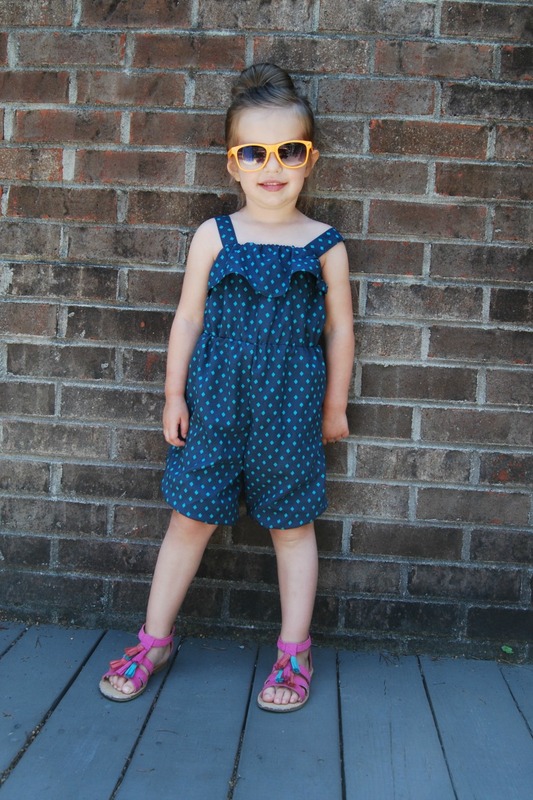 Jane is three years old but she wears a 4T in rtw. She's tall for her age, too. Fabric Used: Rayon poplin. When I made my recent maxi dress, I also bought a yard and half of this same Cotton and Steel rayon poplin in this color way. When I ordered it, I though the navy would be the same and I could use this one with the teal diamonds for contrast. The navy is not the same, however. This particular blue is much more of a denim blue. I also figured I would have some of the original rayon left over and I could always make another garment with the two. Well, I used every scrap to make that maxi dress and then stuck this small piece in stash. It was perfect for this romper. So Jane's romper is made of some pretty swanky fabric. I do wish the camera had focused on her instead of the background. I was lazy and took all these on an automatic setting. But this photo. I love it. 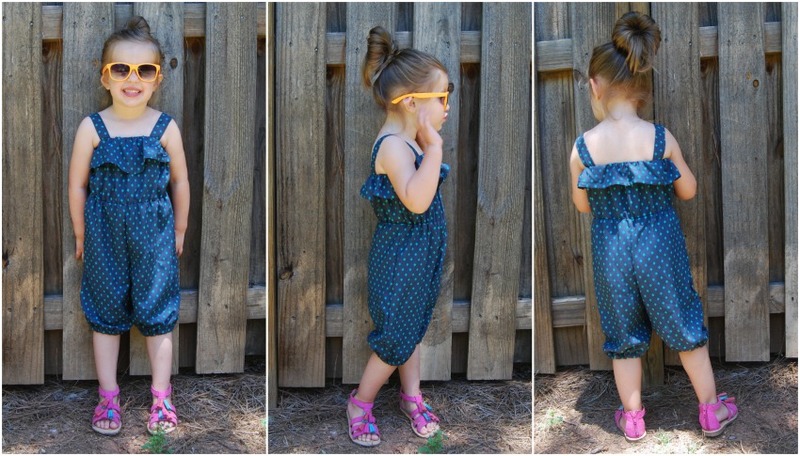 Alterations/Deviations: While being a super cute pattern, it was very fiddly to sew. There was lots of trying on to measure elastic and placing straps. The elastic guide for the casing at the chest was way, way too long. I pulled that piece of elastic pretty tight to hold up the romper. The waist casing didn't have an elastic guide. I left that piece of elastic pretty loose for comfort. The elastic in the leg casings are loose, too, which is why you see them riding up above her knee in photos. It's cute either way. I also had to give her some more room in the crotch after the fact. It fit when I was done, but when she moved around it definitely rode up and looked a little uncomfortable. I unpicked the waist seam and sewed the crotch seam about 3/8" lower. And I then I sewed the waist seam back on with a smaller seam allowance (using a smaller width of elastic) to give even more room- probably another 3/8" inch. So I gave her more room in the crotch by lowering everything almost 3/4" inch. Just something to pay attention to if you are sewing this pattern. But she is tall. Likes/Dislikes: I mean, again- how stinkin' cute is finished product. I can't help but love it. But I do have to complain a little about the instructions. They were confusing. All the instructions for the different views are written together. I had to use a highlighter to mark which parts were for my view. I did follow the instructions closely since I wasn't sure about the order of construction. And it all worked out. Except in the end, there was never a proper explanation of how to attach the front straps for view C. The instructions and illustrations didn't take in to account the ruffle. I worked it out but I can see that this would be frustrating for someone who was new to sewing, since this is a "Learn to Sew" pattern. I flipped the ruffle up and sewed along the top of casing to attach the front of the straps in case you are wondering. I also need to tighten up that one strap a little. It keeps slipping off her shoulder. If I made this again, I'd just use the straps that tie. They would be much easier to sew in and would also be adjustable after the fact. This is when I told her to "strike a pose." Lol. Conclusion: I love the end result. Jane loves it, too. She wore it straight off the sewing machine. She says it's comfy. I know we'll get lots of use from it this summer. OMG can't even handle the cuteness in this post! 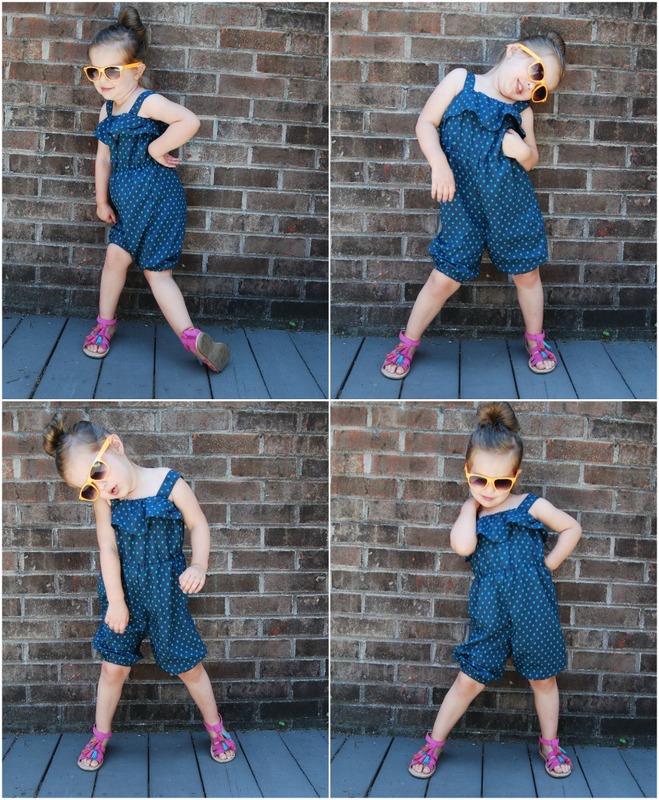 Love that fabric, adorable pattern, and so much fun cute sassiness in the pics!! So, so, so gorgeous. You have a little character there, for sure. Must be hours of entertainment! First your title made me think of a Bobby Brown song that's soooooo inappropriate for this post! I need help! LOL! Second both the model and the garment are gorgeous and third I need to buy this pattern for the grandbabies. You should definitely make another one! Bahaha!! I actually thought the same thing when I wrote the title but decided to leave it anyway. And now I've been singing it all morning! Oh my goodness!! This is so cute, as is your little girl! What sass! Oh my goodness, stickin' cute would be your little model. She's been watching you!!! The romper is adorbs. Yup, what everyone else said - both Jane and her romper are adorable! Don't think the nephews would go for this, why are there no little girls for me to sew for!! 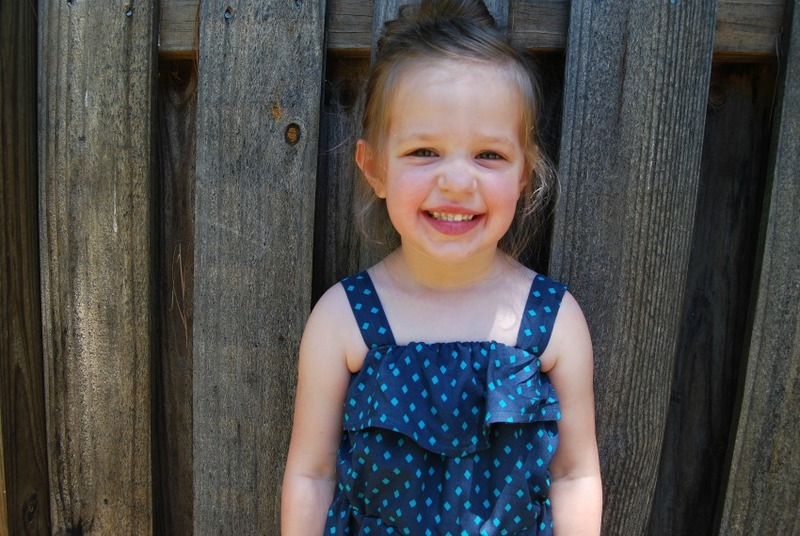 Oh my goodness, your little girl is super cute (and she has got so big! ), I bet she keeps you on your toes! 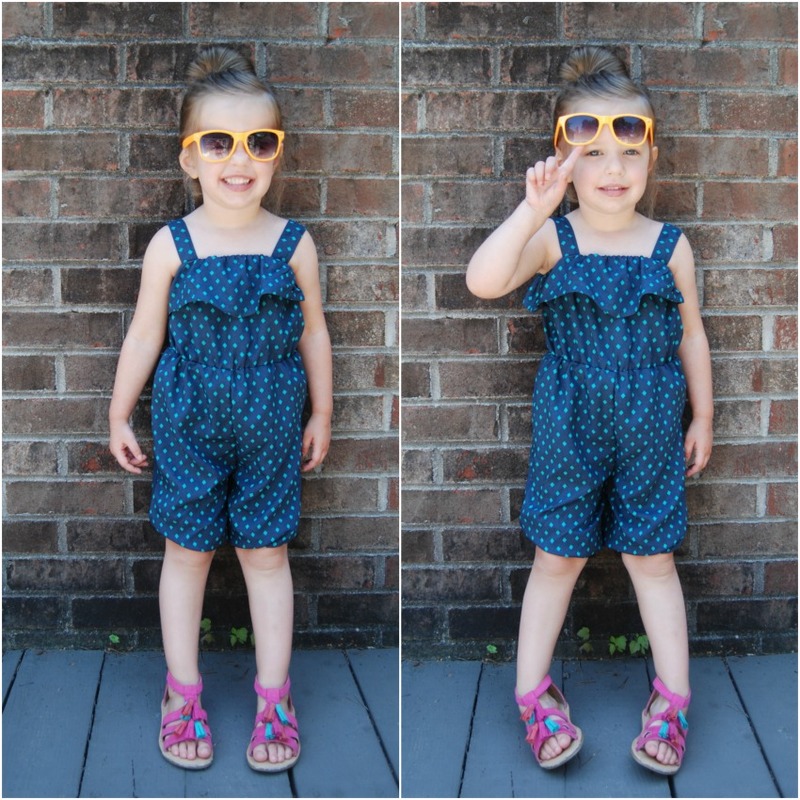 The romper is adorable and it looks like Jane loves it as much as you do. I was going to comment about how much fun it is to sew kids clothes, but then I got to your section about how tricky this make actually was! Well done for persevering with it, it was worth it! Sassy girl! Too cute!!! 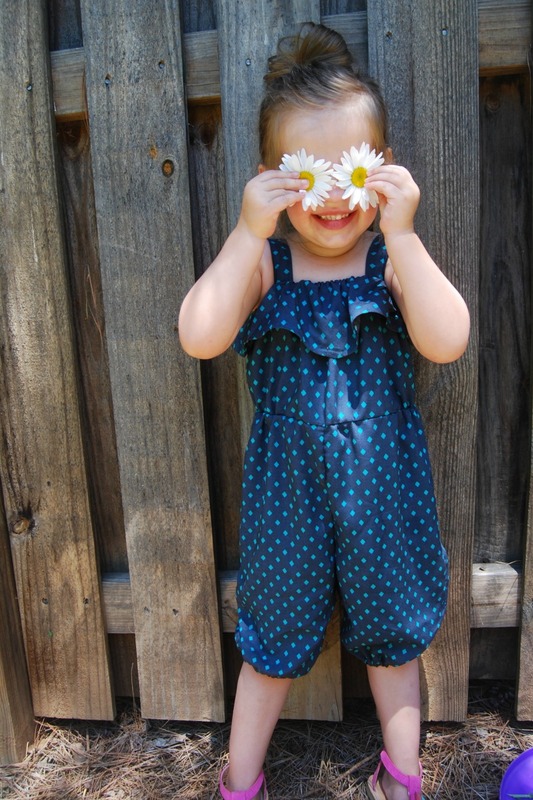 She is ADORABLE and so is the romper! 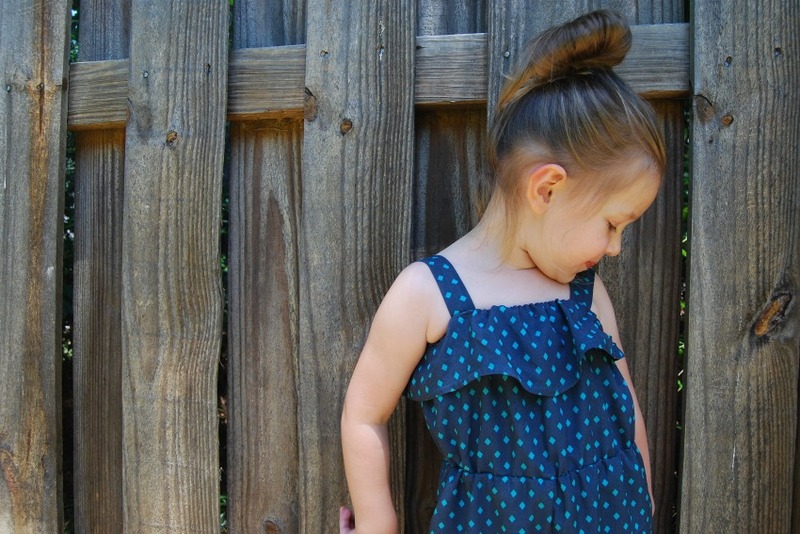 Super cute pattern and oh my hasn't your baby girl grown! Love the overload Liza Jane, she is a gorgeous little girl and obviously loves modelling her Mums cute sewing, love the outfit, what a cutie, I miss the childrens sewing, get so much out of a small piece of fabric.